Shaw's global fame and GBS brand was immense. So much so that when it was announced he and Charlotte, his wife, would visit New Zealand in 1934, New Zealand was agog. In a February council meeting that year when Auckland’s mayor was asked if there would be a civic reception for Mr Shaw, a councillor noted, “It is possible that Mr Shaw, in a moment of aberration might make an attack upon our noble city and our city fathers. Therefore I should like to know whether you intend to give a reception to this illustrious gentleman.” Mayor Hutchison replied he would decide when those who wanted a reception, asked, but later noted that when it came to asking Mr Shaw to speak at functions, "He doesn't as a matter of fact need much encouragement." GBS, 1934. From: NZMS 867-57, Auckland Libraries Heritage Collections. In March the Shaw's arrangements were confirmed in the papers. George and Charlotte would arrive on the Rangitane, and travel through both the North and South Islands. Along the way he planned to visit tourist resorts including Waitomo, Rotorua and the Chateau. The Auckland Star dutifully reported their first glimpses of Shaw on the ship. How he walked with his head down and his hands behind his back up to the cameras and greeted the press. ”Oh good morning ladies and gentlemen. I suppose you have seen at least 50 million pictures of me. You want to see the animal walk before you and you want to hear the animal talk.” He then proceeded to turn to the left, and to the right. “This is the intellectual portion of my brow and here is my back.” The cameras, it was reported, clicked away. In Auckland, the Shaws spent an afternoon at the War Memorial Museum, accompanied by brewing magnate, Ernest Davis. 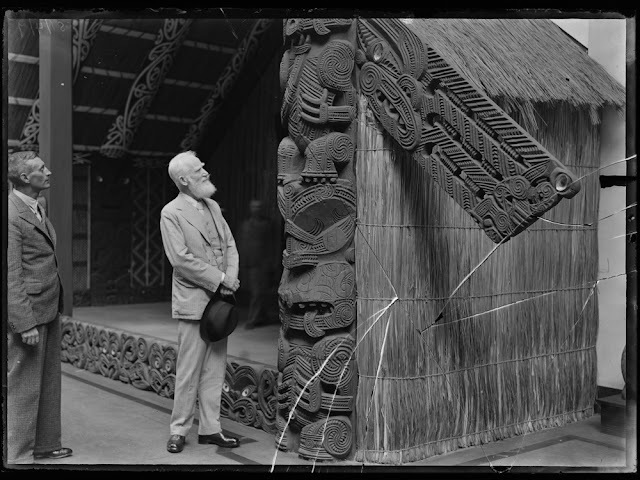 Auckland Star columnist 'Zamiel' in noting that 8288 people visited the museum in a month, noted that if Mr George Bernard Shaw had not visited the museum, then only 8287 people would have visited it. "It is a solemn thought," Zamiel noted, "that if Mr Shaw had been unable to go and a mere sharemilker of Waipukerimu had gone instead, the total would have been the same." After Auckland, Waitomo Caves was the next stop, and to a Waikato Times reporter, Shaw said, “I am amazed to hear that many New Zealanders, including those living so close to the caves, have never seen them. Tell them they ought to be thoroughly ashamed of themselves. I have come 14,000 miles to see them and think they are worth it." AN Breckon. GBS in Rotorua, 1934. From: New Zealand Herald Glass Plate Collection. Auckland Libraries Heritage Collections, 1370-M014-3. In Wellington they visited the Karitane Hospital, to which the Evening Post reported, “To a long list of celebrated names in the visitors’ book of the Truby King Karitane Hospital at Melrose there was added this morning that of Mr. George Bernard Shaw, who with Mrs Shaw spent half an hour there.” When the matron told the famous visitor that all the children were in poor circumstances and in need of help, he exclaimed, "God - what a country!" and then spent an hour with Sir Truby King at his home. Auckland Weekly News. GBS with the matron and nurses of the Karitane Home. Auckland Libraries Heritage Collections, AWNS 19340418-32-1. Ref: George Bernard Shaw, What I said in N.Z. : the newspaper utterances of Mr. George Bernard Shaw in New Zealand, March 15th to April 15th, 1934. Wellington, N.Z. : Commercial Printing and Publishing Co., 1934. Within days of Shaw leaving, a book was put together of his many comments during his trip. 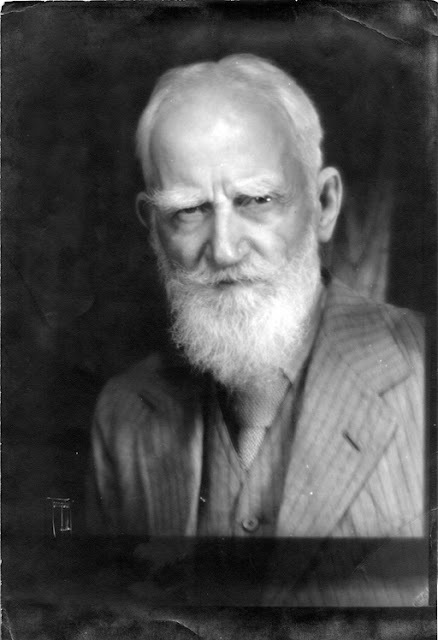 Titled, “What I said when I was in New Zealand: The newspaper utterances of Mr George Bernard Shaw,” it was published within just one week of his departure. Auckland Libraries is delighted to be hosting the exhibition, Judging Shaw, at the Central City Library, in conjunction with the Embassy of Ireland, New Zealand. Curated by Fintan O'Toole and based on his biography of Shaw, the exhibition contains photographs and illustrations, and looks at Shaw's life and legacy, and how he cultivated his GBS brand to generate global fame. Judging Shaw tours several New Zealand centres over the next month, and in Auckland runs for just one week, from 15 March to 21 March. Do come along to the Central City Library to browse the exhibition, and other Shaw-related displays during the week. Image credit: Embassy of Ireland, New Zealand. Miscellaneous newspaper comments sourced from Papers Past. What I Said in N.Z. 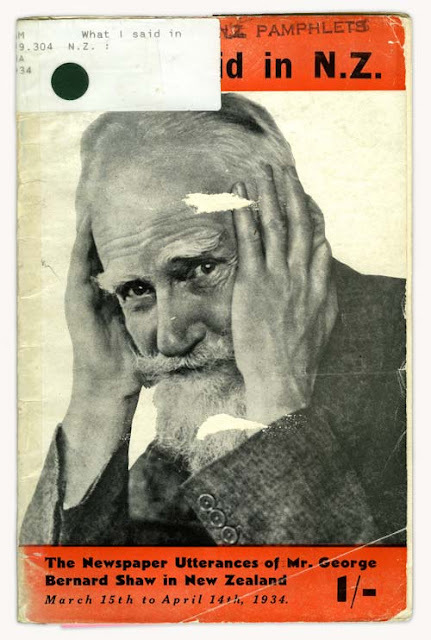 : The newspaper utterances of Mr. George Bernard Shaw, March 15th to April 15th, 1934. Digitised by the State Library of Victoria, Australia.